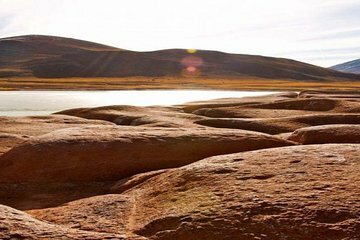 See multiple attractions around the Atacama Desert on this full-day guided tour from San Pedro de Atacama. Enjoy a hassle-free pickup from your hotel and start your day with breakfast (included) in the Miscanti and Miñiques highland lagoons. Continue your day exploring Salar de Talar, the village of Socaire, and Salar de Atacama, Chile's largest salt lake where you can see flamingos. Your final stop is town of Toconao before you get dropped off back at your hotel. We got on the coach, the seats were very narrow and we were very squashed up also it was quite hot. My wife didn't feel very well and thought she couldn't cope with a whole day travelling and so we got off the coach and didn't do the tour.